Date Night starts out with full disclosure: tonight’s date did not happen on a Friday night. 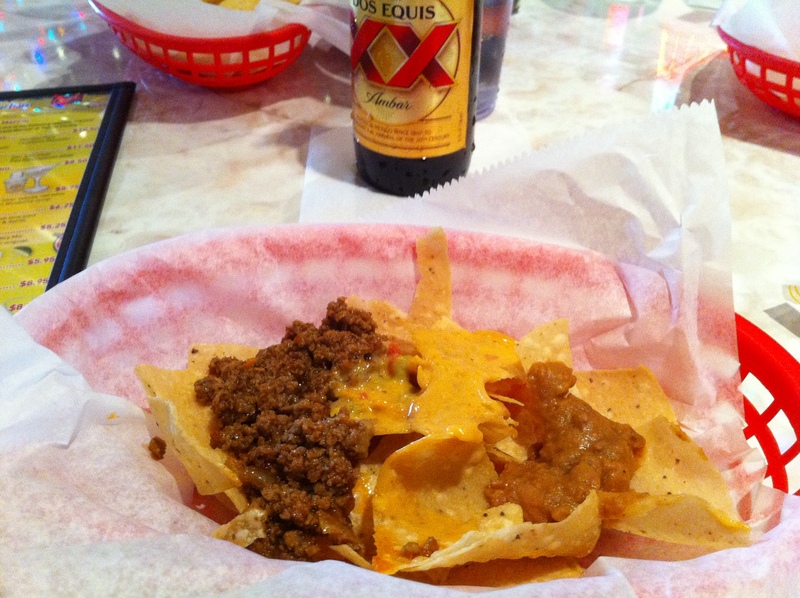 We are out of town this Friday, but we didn’t want to miss a blog entry, so we head to Chuy’s newest location, near Perimeter Mall. We are off, which is a good thing because we could never get to Chuy’s after work on a Friday night because of the terrible traffic in this area. Believe it or not, this location was a Brazilian steak house. 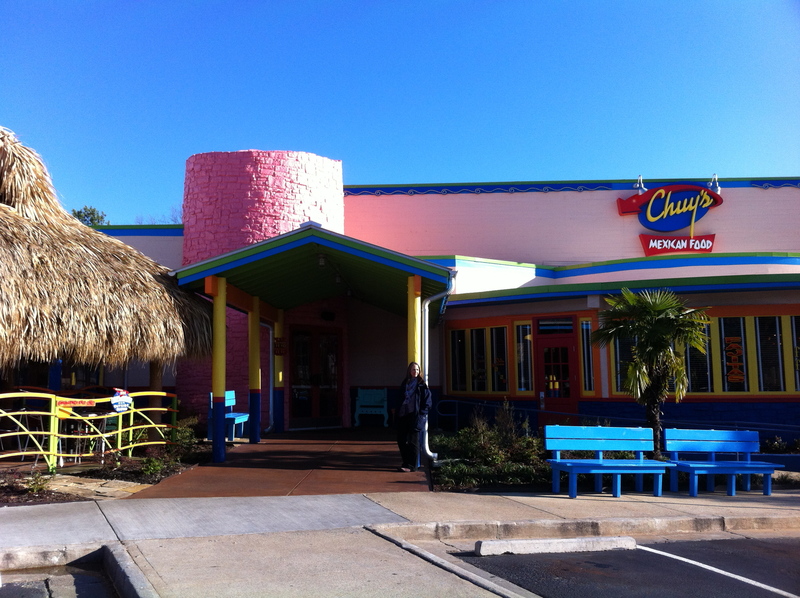 Those with Texas roots know all about Chuy’s, but until recently, the chain had no locations in Georgia. We avoid chains on Date Night like we try to stay away from sick people in the winter, but we have heard great things about this place from Texans and non-Texans alike. 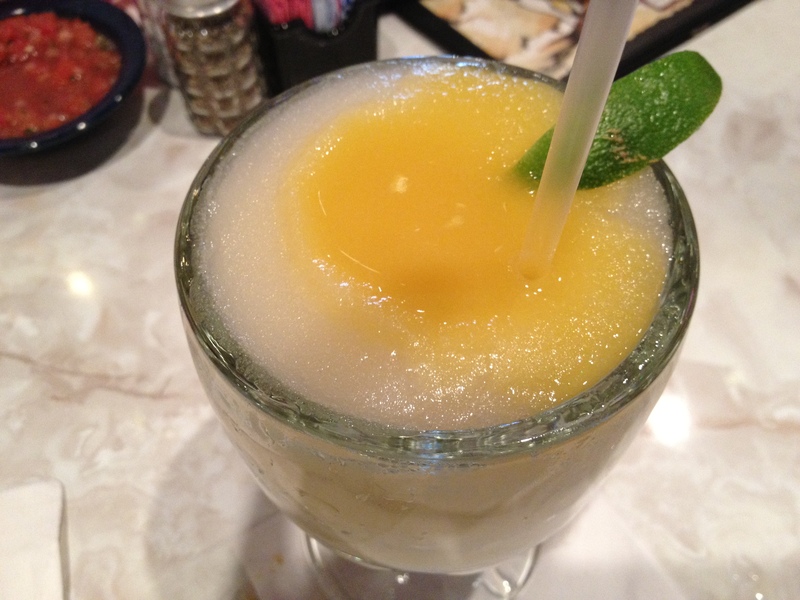 Here’s our first tip on Chuy’s: go during happy hour, which is 4-7PM on weeknights, including Friday. The Nacho Chevy has free happy hour nachos! You get a free nacho bar from the “nacho Chevy” in the large bar. (The “nacho Chevy” is not my Chevy either.). Inside the Chevy ‘s trunk, you find chips, queso, ground meat, retried beans, and two different salsas, enough to keep your nacho cravings satisfied. In fact, if you are not careful, you can fill up on the nachos and not leave room for dinner. Beer and nachos. The perfect appetizer. The happy hour also includes cheap beer and deals on margaritas. Unfortunately, good beer is not cheap, and cheap beer is not good, but if you can actually drink Bud Light and its cousins, then you are in luck. The beer choices are not great, and like with our On The Border experience a few weeks ago, contain no local or craft beers. The beer list is boring and predictable, but I get a Dos Equis Amber (full price!) to go with my free nachos. 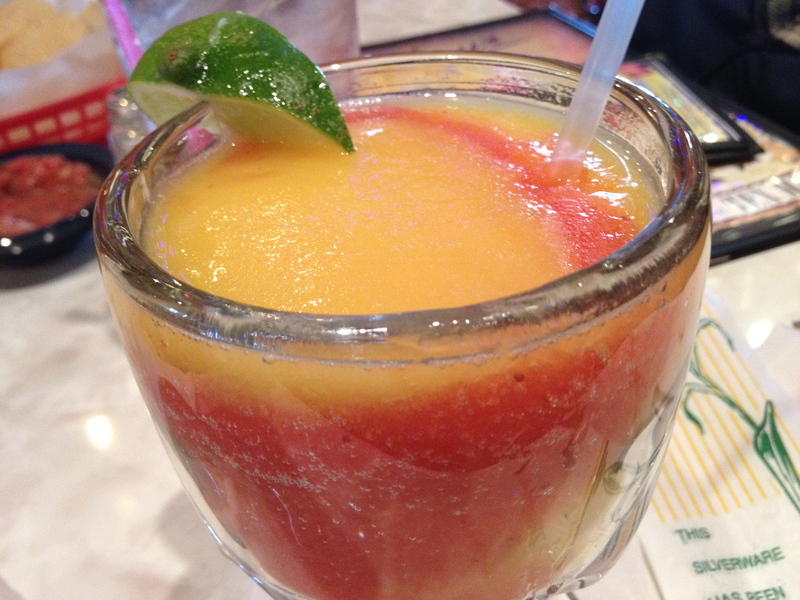 Strawberry and mango swirl margarita. Eve drinks margaritas and is in luck because the frozen fruity ones are part of happy hour. For her nacho accompaniment, she gets a strawberry and mango swirl frozen concoction. It’s quite good, but neither of us tastes much tequila in there. Our drinks must have hit the spot, as they are gone before we even order our dinner. We fall for the oldest restaurant trick in the book: salty “free” food makes you drink more, so you go through your drinks faster. Lime with a mango "dot". That’s not a problem, because we order another round. This time Eve tries the lime margarita with a mango “dot”. It’s not as sweet as the first one, but we still wonder if it has any alcohol content. It’s time to order dinner and we are semi-full, so we decide to share an entree. 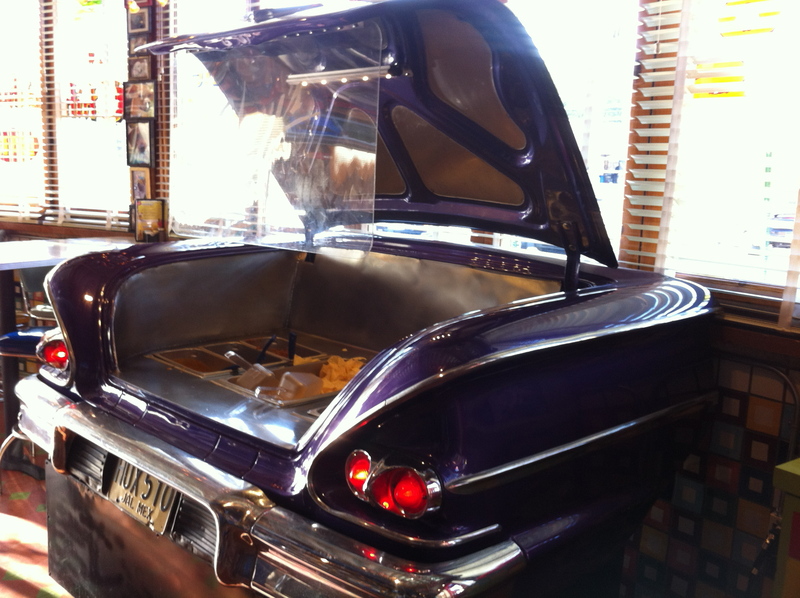 There are many choices, including burritos, fajitas, and tacos, but we are inspired by a blast from the past. 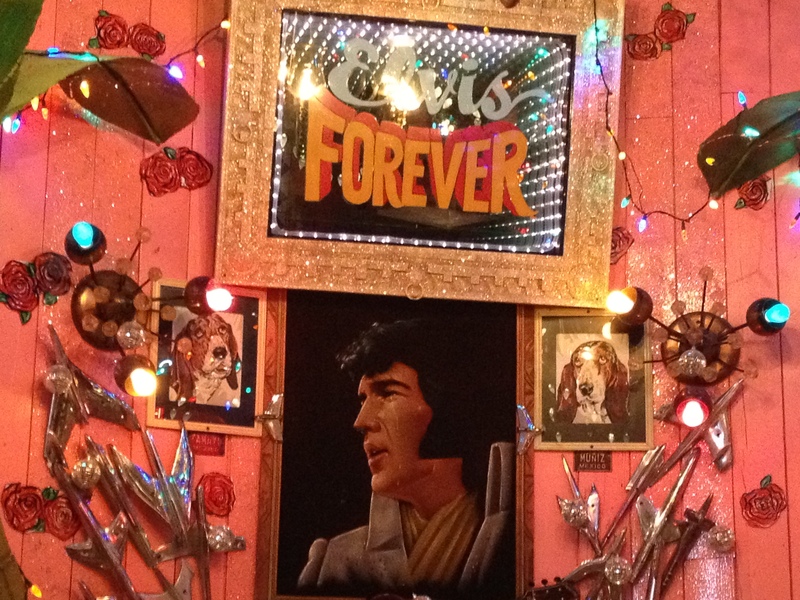 The King lives at Chuy's! We are sitting across from Chuy’s Elvis shrine, and since we are both fans of the King, we have to order “The Elvis Presley Memorial Combo”! It’s so huge that it comes on 2 plates. One has 3 enchiladas (beef, cheese and chicken), rice and refried beans and the other has a crispy taco with sirloin meat and 2 giant tostada chips dipped in queso. It’s way too much food (even for sharing) and although it’s a meal fit for a King, we do not finish it all. We are not sure Elvis could have finished all this food. Loyal readers know that we are big fans of dessert and almost never skip it, but on this night there will be no dessert. 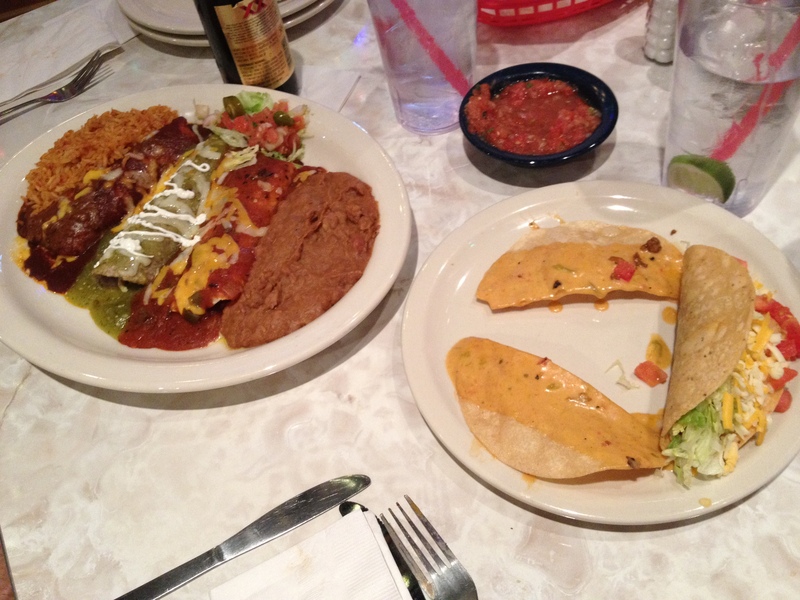 We leave Chuy’s happy and full. The service is great and the place lives up to its Texas-sized hype. If you are in the Perimeter area, it’s definitely worth a visit.